How to do base conversion using library method in Java? Home Questions using library methods How to do base conversion using library method in Java? Write a program in Java that converts the Decimal number to Binary, Octal and Hexadecimal numbers using a library function. We are using following methods of Integer class. // Regular expression that matches String containing only digits [0-9]. 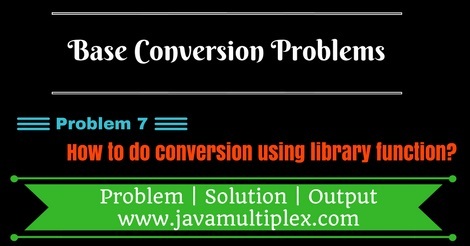 Output - How to do base conversion using library function in Java? Tags : Conversion problems, Decimal to Binary, Decimal to Octal, Decimal to Hexadecimal, Solution in Java, String, Integer, if else statement.